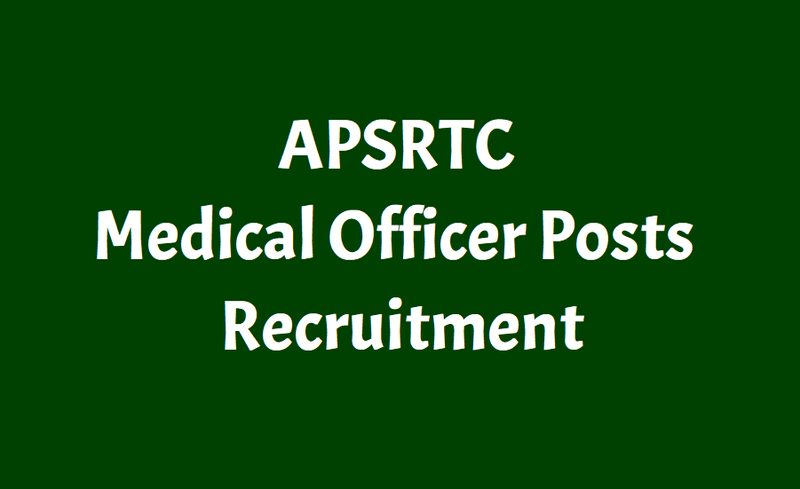 APSRTC Recruitment for Medical Officer Posts 2018, Last date : December 07: APSRTC Medical Officer Posts Recruitment 2018 and Last date to apply is 07.12.2018. Andhra Pradesh State Road Transport Corporation, APSRTC has issued the APSRTC Medical Officer Posts Recruitment 2018 notification and invites applications from the eligible candidates for engagement of Medical Officers(General) on Contract Basis. Qualification: MBBS. 2 years experience in case of MBBS after House Surgery or Post Graduate Degree/ PG Diploma. Age limit: Candidates should have age below 40 years of age as on 01.07.2018. Remuneration : The selected candidates will be engaged purely on Contract basis on a consolidated pay of Rs. 53,495/- per month. Note: The same is subject to recoveries as per TDS provisions of IT Act and other statutory recoveries. Duties: The duties involve Medical treatment of employees and their dependents as per Corporation Rules. Selection Prcess: Candidates would be selected based on marks obtained in final year MBBS, Additional Qualification, Experience and Interview. Application fee: Rs. 400/- (Rupees Four Hundred only) by way of Demand Draft (DD) drawn in favour of FA & CAO, APSRTC, RTC House, Vijayawada shall be enclosed along with application form. Fee once paid is not refundable under any circumstances. Lis of Certificates: The candidate shall enclose copies of the following Certificates along with the application. All the Xerox copies of the certificates should be self attested by the candidates. How to apply: Application completed in all respects shall be sent to- The Dy. Chief Personnel Manager(HRF & W), VC & MD's Office, RTC House, NTR Administrative Block, APSRTC, PNBS, Vijayawada.